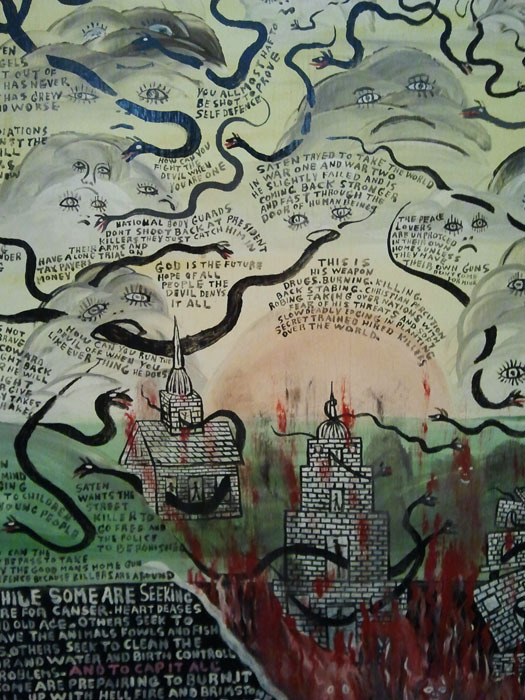 Hell, at the Intuit, is a bright collection of work that takes a hard look at the evils of life. The artists that are in this show obviously deal, or dealt with, these ideas regularly in their daily lives rather than, like most of us, deep inside ourselves. Being so familiar with the material, they are able to conjure up imagery that most artists would feel might be too overt, and for them it very well may be. Without a formal arts education to decipher for them a random group of rules, they are free to examine art however they feel. 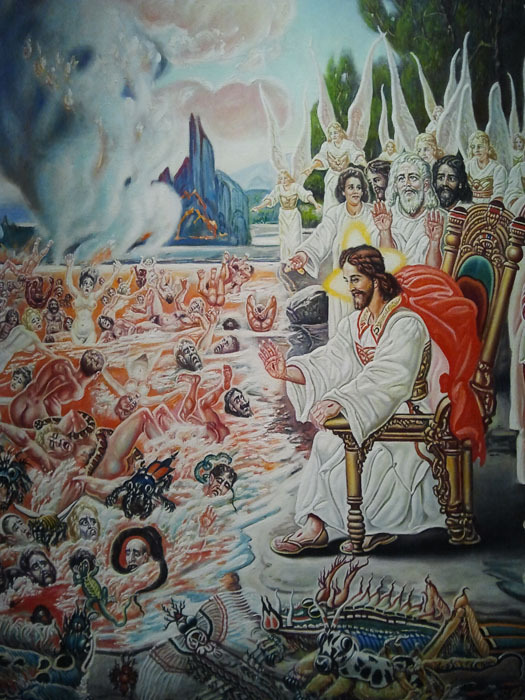 One of the paintings by Howard Finster says right on the painting, "You may see this painting again in hell", when I read that I thought 'that is very possible.' As an artist myself, I often find that the hard part of my job is to make something that is imbued with a spirit at all, much less one that I dictate. Each one of these pieces has a spirit reaching out trying to save me from the evils that are all around me. These works were made, I think, to protect me. There very well may be a few that do not do this, but as a whole I found myself surrounded by art that was made with so much love for me, the viewer, that I was overwhelmed. Each piece stands as a testament to what you can do if you follow your path and embrace what you love. 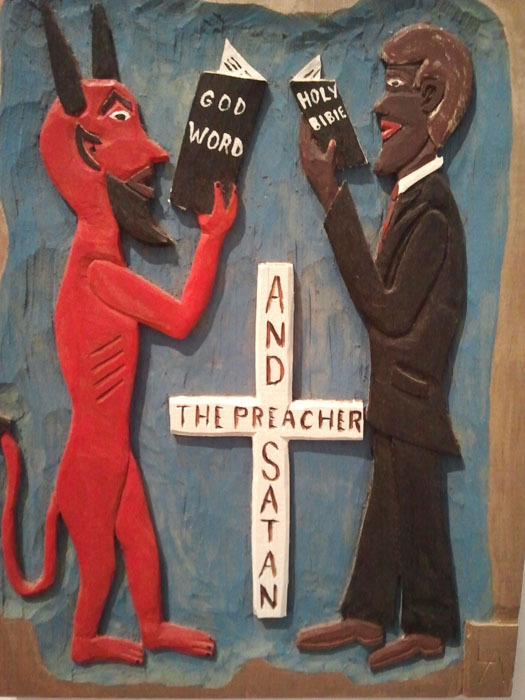 I have always been an admirer of 'outsider' art, and lets face it, most of that tends to be at least a little religious. This is a must see show. 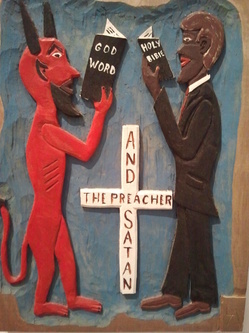 After a brisk walk down Chicago Avenue I arrived at LUMA to see the other half of this exhibit, Heaven. All at once I was in a completely different environment, more pristine and reverent with two guards and the soft museum hum that comes from the ventilation system, or the lights. This half of this show lacks the punch that is so prominent in the Hell half. This is not to say that Heaven has little to offer, in fact it may have more, although softer. 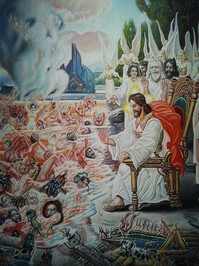 I have to start by saying the quantity of work in Heaven far exceeds that of Hell. Story telling is prominent in Heaven, as much as the hell show talks to you as a sinner from the perspective of objects that call to you to change your ways, Heaven tells stories and illustrates why it is a good idea to stay on the right track. Angels and Jesus keeping a lid on the demons, glitter, rays of light, symmetrical design and of course smiles all work together and help the artists attempt to depict what is waiting for them. With messages written in these works like, "Don't make Atom bombs" and "It don't have to be that way" the Heaven show has to cover a lot of ground to show you that God is there looking down on us from above, always above. 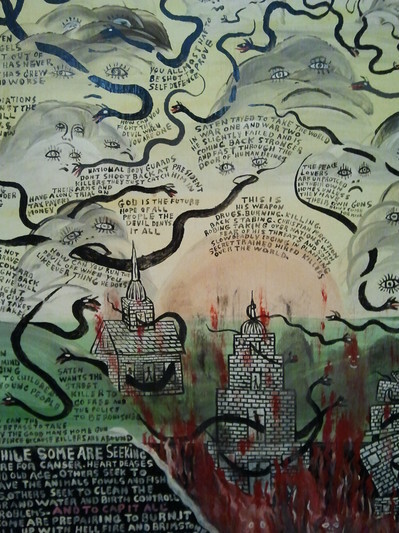 Heaven + Hell is a huge collaborative success, and will be on exhibit until June 30 at both Intuit and LUMA.